The most massive black holes in the universe are often encircled by thick, doughnut-shaped disks of gas and dust. This deep-space doughnut material ultimately feeds and nourishes the growing black holes tucked inside. Until recently, telescopes weren’t able to penetrate some of these doughnuts, also known as tori. 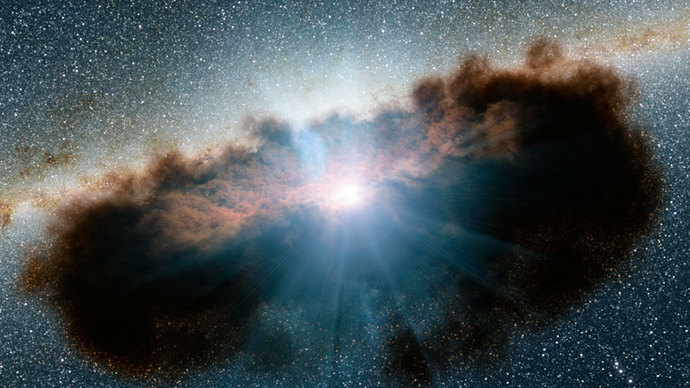 “Originally, we thought that some black holes were hidden behind walls or screens of material that could not be seen through,” said Andrea Marinucci of the Roma Tre University in Italy, lead author of a new Monthly Notices of the Royal Astronomical Society study describing results from NASA’s Nuclear Spectroscopic Telescope Array, or NuSTAR, and the European Space Agency’s XMM-Newton space observatory. The complete story, courtesy of Caltech is here.